Cottage, 1 chambre +1 lit queen et canapé-lit), 1 salle de bain, (2adult 2kids). Oaxaca, Oaxaca Des frais supplémentaires de 15 $ sont facturés pour les adultes supplémentaires. salle de location supplémentaire pouvant accueillir 1 à 2 personnes pour accueillir une famille de plus de 4 personnes. Femme de ménage deux fois par semaine et blanchisserie, préparera les repas en supplément. Deux pâtés de maisons du musée / jardin botanique et de Alcala - l'allée piétonne regorgeant de boutiques de luxe qui vous mènent à Zocalo. Un pâté de maisons du marché ouvert Sanches Pasqua facilite la préparation du dîner. Cottage est situé sur un composé avec une autre location Casita. We had a lovely stay at this very sweet casita. It has a great location close to el Centro. The house was relatively quiet considering the central location. The caretaker was attentive and washed our clothes on her cleaning days. It was safe and comfortable for our small children.We were very happy with our stay. Amazing location! Devi the caretaker was very nice and met us late at night for our check-in. The place was very clean and had a warm shower. The location is wonderful to the center, however the construction that is going on next door starts at daylight and goes until late at night. The host is easy to communicate with and very helpful with tips on getting from the airport to the house. i would recommend this place!! Had a great stay here for Guelaguetza. The place is walking distance from the events and nicely located down a safe and quiet alley. We stayed here for three weeks and enjoyed each and every day. The casita is directly on a dead-end alley where, for the most part, cars are not parked. This is a studio apartment with two large rooms. When you enter there is a nice leather couch (pulls out) with an end table and lamp, a wooden cabinet and a small table and two chairs. The bed is in this first room and is very comfortable. There are two bedside tables with lamps and a large armoire for hanging clothes and empty drawers for everything else. There is a good sized kitchen with modern appliances and plenty of food prep tools, cooking pans and dishes. It has a full sized table and six chairs in the kitchen. There is plenty of natural light and a small patio next to the garden with a table and chairs. We often enjoyed coffee in that spot in the morning. Bathroom with shower is clean with plenty of towels. Our on-site person, Debbie, lives in a small casita in the same small complex. She cleaned twice a week and did our laundry. Debbie does not speak English but we did fine with Google Translate. She is a sweet girl and was available to help us in any way we needed. There is a great market about a block from the casita where you can pick up nearly every food items you need. Also, there is an awesome bakery two blocks away and several good restaurants and coffee shops very close. In short there is everything is within walking distance. A extremely important feature is that internet access is very good for Mexico. I would highly recommend this lovely little gem to anyone wanting a clean, convenient and comfortable place to stay in Oaxaca. Casita Toronja isn’t fancy but was a great choice and pleasant base for my Oaxacan visit! The casita is a moderate sized two room house; with the bed and sitting area as you enter and the full kitchen (minus a blender) and dining table occupying the other room. You are provided clean water with a large tippable water jug/bottle for your daily use. The WiFi was secure and reliable which I greatly appreciated..(I didn’t watch TV, so I’m unable to comment.) Even though I was there in January, the days can get warm and in turn the casita heats up. Having the overhead fans made that short time period during the day more comfortable. During the evening when Oaxaca cools down, the casita is stocked with extra blankets to keep you warm at night. Debbie (the caretaker) willingly but needed to help me with laundry (the setup is different then what I was familiar with) and even hung them up on the clothesline. We managed beautifully; though she spoke no English, I spoke a LITTLE Spanish, we used hand signals and the translation on my tablet to aid in our communication. This casita is located in a more residential neighborhood, which means it is quite at night but has typical workday noises in the morning. 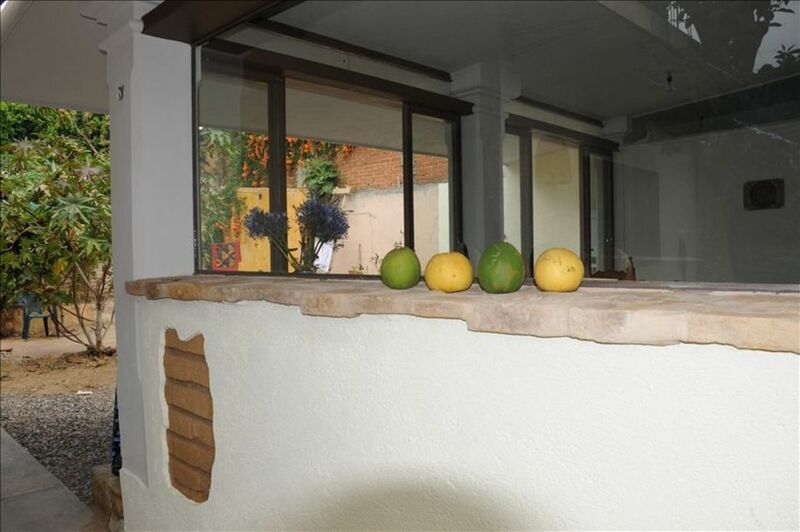 I would recommend this casita to others that are planning on visiting Oaxaca! I stayed in the casita and found it to be a wonderful and comfortable stay...I agree with all the other positive reviews and not sure what to make of the one negative? As in the pictures all was in working order and nothing was broken. I enjoyed the location being able to walk to zocalo and food market near was great for cooking meals had modern appliances and Kitchen needs. New TV , wifi..will come back soon! Visitez vue archéologique de Monte Alban Visite en bus ou excellent guide Pablo qui gère également la casita # son est dans la feuille d'information que vous recevrez. Apprendre l'espagnol ou le tissage dans les écoles à proximité.